Residential Junior Colleges -15 for Boys and 20 for Girls. Day starts with the physical exercises and Classes will commence at 5.30 AM and academic activities will continue till 10.00 pm in the night. system is adopted to look after and guide the students staying in the hostel. 2. Spl category Reservation: PHC:3%, Sports:3% CAP( Children of Armed Personnel):3%. who have passed in earlier years are not eligible and need not apply. Date of Examination: 10.05.2019 from 10.00 AM to 12.30 PM. 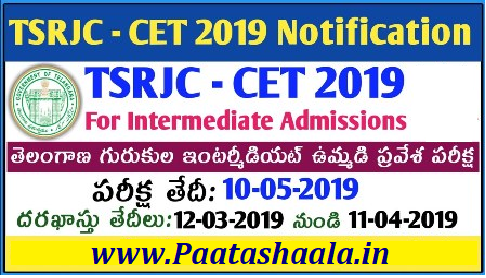 for appearing for TSRJC-CET 2019.
card Payment gateway for submission of application through Online. confirmation of the fee received. uploaded along with the application form. opted, that cannot be changed. original certificates Caste, Income, Study, Special category by the time of counselling. the Hall Ticket. The copy of online application is to be preserved for further reference. must take utmost care while filling the online application. documents at the time of admission. 01.05.2019 to 08.05.2019 with the reference number allotted to them. be issued/ posted to the candidate. 4. No candidate will be allowed to appear for the examination, without hall ticket. Reservation, Special category and Local area. candidature shall be considered for CEC also and Vice versa. merit list of Children of Armed Personnel, PHC and Sports categories against OC. PHC candidates. Minimum disability is 40%. BPC and Social Studies for MEC or CEC will be considered. and for BPC, Mathematics for MEC or CEC will be considered. information, the fault lies with the candidate only. candidates for counselling shall be made available on the website: tsrjdc.cgg.gov.in. called for counselling for allotment of seats for admission in the ratio of 1:5.
furnished by the candidate are found incorrect or against the rules of admissions. Date of First counselling :28.05.2019.
the last date of admission into first year intermediate as announced by TSBIE, Hyderabad. Telangana Residential Junior College Common Entrance Test (TSRJC) is a well known entrance test for admission to Intermediate courses like MPC/BI.P.C/MEC/CEC in Residential Junior Colleges in Telangana State for the academic year 2018-2019.Telangana state government provides high class education to who are unable to study in leading private institutions .In this colleges, they are providing EAMCET Coaching and other competitive exams as well.TSRES (Telangana Residential Education Society) announced the TSRJC 2018 Notification of 2018.So eligible candidates those who are interested may apply online only.To know more details regarding TSRJC 2018 Application form, fee,Eligibility,Exam date,How to Apply and other information given below. The following eligibility criteria are eligible to appear for TSRJC 2018 Exam. Candidate should have passed SSC Examination in first attempt in APRIL/March 2018. Upload the Scanned images of Color Photo & Signature in JPEG/JPG. Take print of the filled application form. 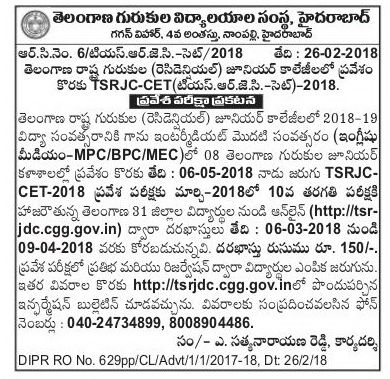 The TSRJC 2018 Counselling will be started in 1st week of July 2018.Qualified candidates will be called for counselling according to merit list prepared by Telangana Residential Society(TSRIES). Information for would also be available on the online.Counselling will be conducted in two rounds.If seats remain vacant after admission of recommended candidate during the first round of counselling,second round of counselling will be held. Declaration of TSRJC 2018 Result will be in last week of June 2018.The conducting authority will conduct the TSRJC examination,evaluate the answer sheet and likely to declare the result by the last week of June and same will be hosted on website.As soon as the results is ready, the board will host the results on the website and thereafter candidate may download the result.